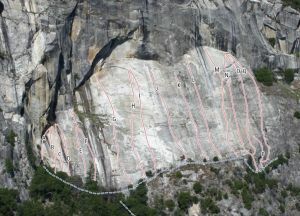 This is the left of two bolted routes on the polished rock at the far left end of the Cookie Sheet. A fun contest can be had by starting at the ground and lead-racing a buddy (climbing on Slipstream) to the top. P1: five bolts to two-bolt anchor, 95 feet, 5.7 P2: two bolts plus one fixed pin to anchor, 70 feet, 5.5 Combine P1 and P2 with one 60m rope.